KNIPAN is the name of a black seabird with a dark green head, and of this 14′ boat built by Larserik Blixt, of Yxlan, Sweden. They launched her on May 7th amidst friends and family and warm spring sunshine. Larserik noted that his grandchildren named the boat and anointed her with pear soda. He started the project five years ago as he began looking at drawings of old sail boats. 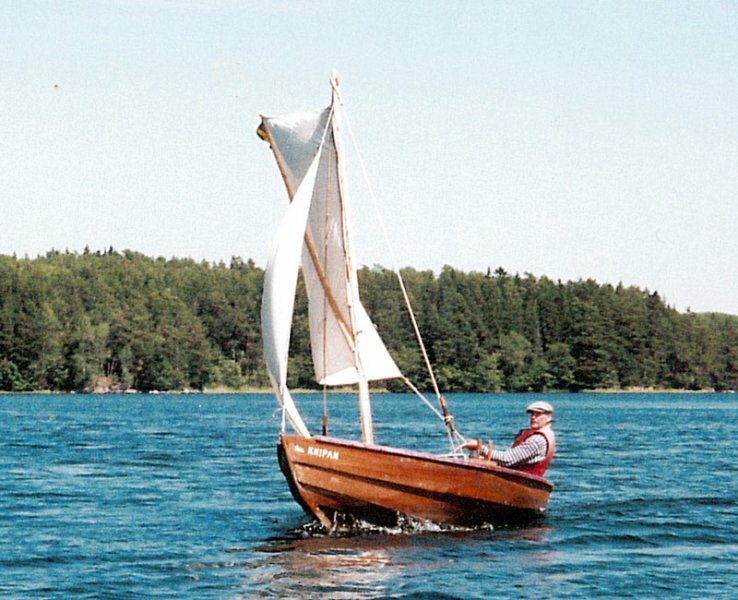 He took his ideas from a Swedish workboat from the 17th century . He came up with own molds that he drew first on paper before transferring the lines to wood. He built his own steam box and stove. The hull is all oak. Mast and spars are spruce. He sewed the sails himself from cannabis sativa. You can contact him at larserikblixt@hotmail.com.